Time to Play: 20-40 Min. 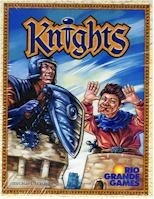 Players are knights competing to build castles in the kingdom. But building castles is not the only way to win. There are actually three ways to win: build four castles with different banners, build three different castles and topple the king, or build two different castles and win three tournaments. Players also have the opportunity to acquire special abilities. Players acquire the special abilities, build the castles, and win the tournaments by throwing six dice three times to beat the dice combination on cards that represent the castles, tournaments, and special abilities. Players may also attempt to capture cards from other players and may acquire special cards to protect their cards from capture. The first player to reach one of the three winning conditions is the winner! Players need a good mixture of luck and skill to win this game.